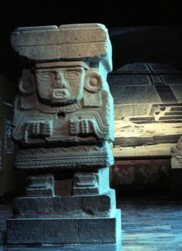 Teotihuacan, the Largest Prehistoric City in the Americas. 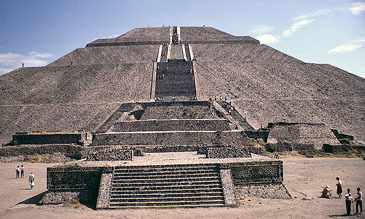 The Pyramid of the Sun is the largest of an immense array of pyramids in the Valley of Mexico, northeast of present-day Mexico City. 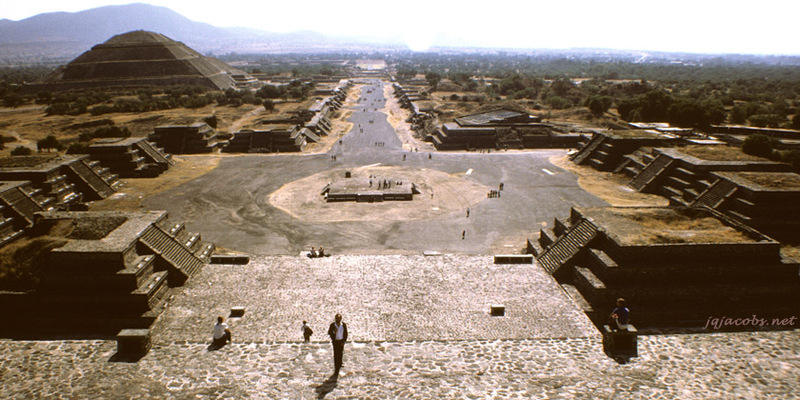 This view is the westward side as seen from the ancient city's central avenue, seen below. Teotihuacán's central avenue, the so-called 'Avenue of the Dead,' extends southward from the Pyramid of the Moon for four kilometers, past the Pyramid of the Sun and the entrance of the Ciudela. 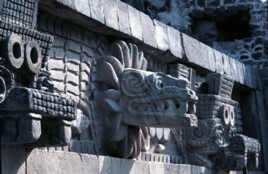 The Quetzalcoatl Pyramid, seen below, is located in the center of the Ciudela. This view of the stepped front facade of the Quetzalcoatl Pyramid illustrates the elements of the repeating design. 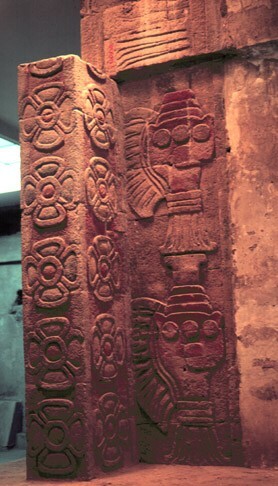 Feathered Serpent and Tlaloc masks project from the facade of the Quetzalcoatl Pyramid. The Quetzalcoatl Pyramid facade has been partially recreated in the National Museum of Anthropology in Mexico City. 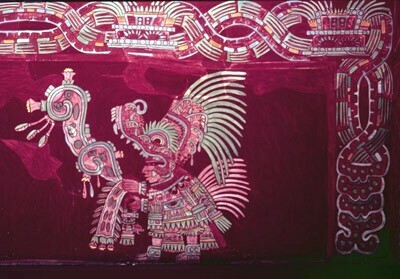 Trace amounts of the original paints allowed for a full color recreation. 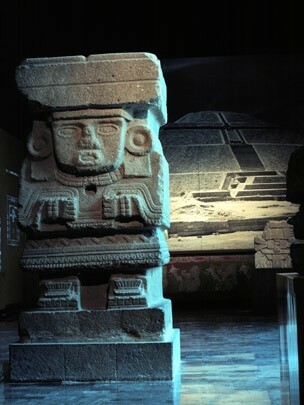 An immense monolithic statue of Chalchiuhtlicue from Teotihuacan is housed in the Teotihuacan gallery of the Museum of Anthropology, Mexico City. 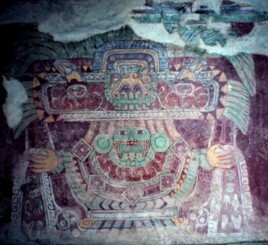 Most surfaces of the multitude of pyramid facades at Teotihuacan were painted with bright colors. 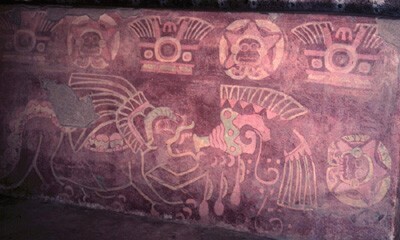 Vivid fresco murals also decorated the interiors of buildings. 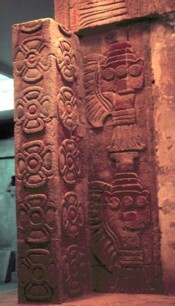 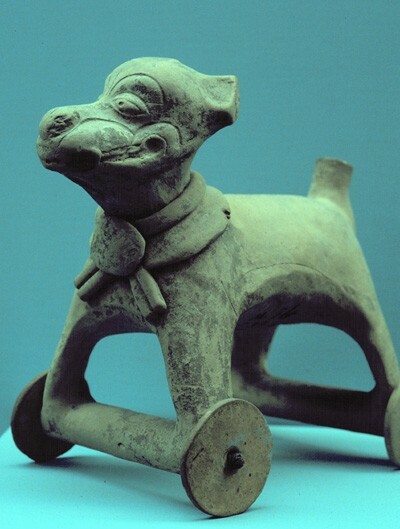 Several are recreated in the museum. 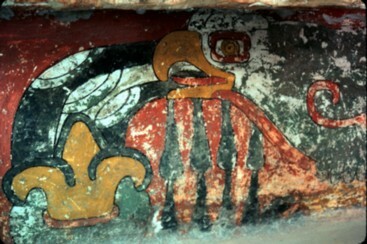 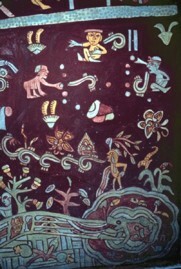 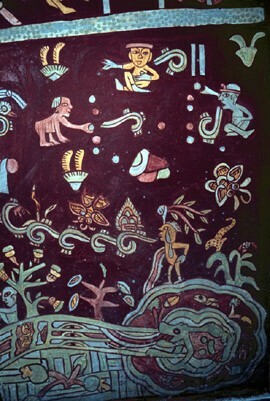 On the same level and a few feet away are found well preserved murals of eagles and jaguars. 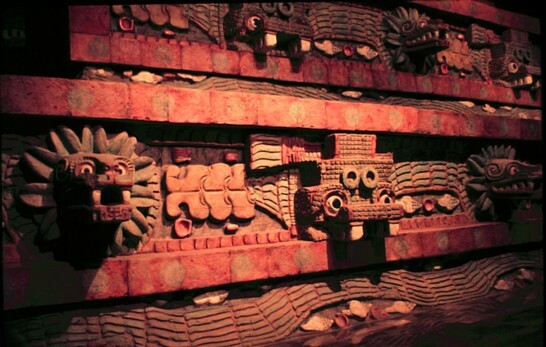 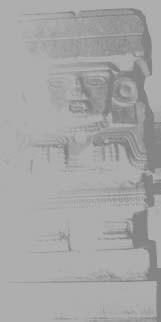 Excavations at Teotihuacan have revealed that older structures were infilled and built upon with newer buildings. 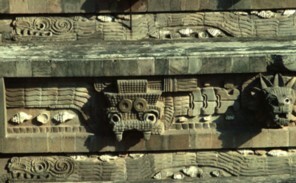 This view is of an excavated substructure near the Pyramid of the Moon. 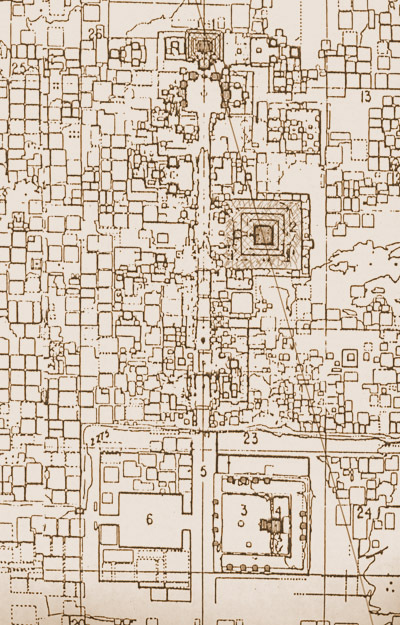 Many areas of the city center have several layers of ruins, preserving an older era of building below successive construction.